Spiders are air-breathing arthropods that have eight legs and chelicerae with fangs that inject venom. They are the largest order of arachnids and rank seventh in total species diversity among all other orders of organisms. Spiders are found worldwide on every continent except for Antarctica, and have become established in nearly every habitat with the exceptions of air and sea colonization. Spiders differ from other arthropods in that the usual body segments are fused into two tagmata, the cephalothorax and abdomen, and joined by a small, cylindrical pedicel. Unlike insects, spiders do not have antennae. In all except the most primitive group, the Mesothelae, spiders have the most centralized nervous systems of all arthropods, as all their ganglia are fused into one mass in the cephalothorax. Unlike most arthropods, spiders have no extensor muscles in their limbs and instead extend them by hydraulic pressure. What are the signs and symptoms of spider bites? Spiders are arachnids which build web in all its infestsed places. Spider webs are the indications that your house has got haunted by spiders. It gives very nasty look to your house walls and the corners. When they are left undisturbed they remain in their web and expand its web. If disturbed spider may bite you. You might have already aware of spider from Spiderman film. But it will be very funny if you thnk that you can become a spider man if a spider bites you. It is a complete ridiculous, spider bite may cause serious skin problems. Symptoms of Spider bites may include pain which may be at the bite or involve the chest and abdomen, sweating, muscle cramps and vomiting among others. Bites from the recluse spiders cause loxoscelism, in which local necrosis of the surrounding skin and widespread breakdown of red blood cells may occur. Headaches, vomiting and a mild fever may also occur after the bites. Almost all spiders are venomous, but not all spider bites result in the injection of venom. Pain from non-venomous, so-called 'dry bites' typically lasts for 5 to 60 minutes while pain from envenomating spider bites may last for longer than 24 hours. Bleeding also may occur with a bite. Signs of a bacterial infection due to a spider bite occur infrequently. If you are looking for Pest Control Spider Agency for your premises, You can contact Pest Control Gurgaon. Pest Control Spider Services Gurgaon: Do it yourself (DIY) Service for Spider Available. After removal of large group of spiders, Pest Control chemicals Gurgaon provide to control the Spider permanently. 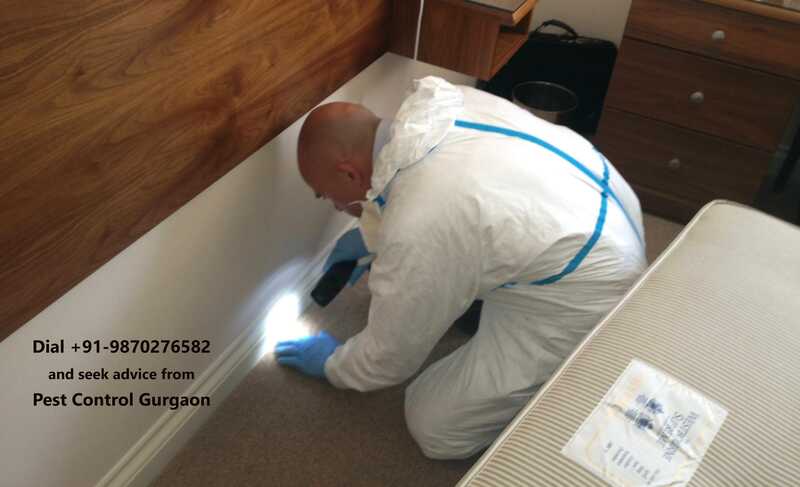 Call : +91-9870276582 to grab the services from Pest Control Gurgaon. Spider bites:- Although spiders are widely feared, only a few species are dangerous to people. Spiders will only bite humans in self-defense, and few produce worse effects than a mosquito bite or bee-sting. Most of those with medically serious bites, such as recluse spiders and widow spiders, would rather flee and bite only when trapped, although this can easily arise by accident. Funnel web spiders' defensive tactics include fang display and their venom, although they rarely inject much, has resulted in 13 known human deaths over 50 years. They have been deemed to be the world's most dangerous spiders on clinical and venom toxicity grounds, though this claim has also been attributed to the Brazilian wandering spider, due to much more frequent accidents. There were about 100 reliably reported deaths from spider bites in the 20th century, compared to about 1,500 from jellyfish stings. Many alleged cases of spider bites may represent incorrect diagnoses, which would make it more difficult to check the effectiveness of treatments for genuine bites. Body plan:- Spiders are chelicerates and therefore arthropods. As arthropods they have segmented bodies with jointed limbs, all covered in a cuticle made of chitin and proteins; heads that are composed of several segments that fuse during the development of the embryo. Being chelicerates, their bodies consist of two tagmata, sets of segments that serve similar functions the foremost one, called the cephalothorax or prosoma, is a complete fusion of the segments that in an insect would form two separate tagmata, the head and thorax the rear tagma is called the abdomen or opisthosoma. In spiders, the cephalothorax and abdomen are connected by a small cylindrical section, the pedicel. The pattern of segment fusion that forms chelicerates' heads is unique among arthropods, and what would normally be the first head segment disappears at an early stage of development, so that chelicerates lack the antennae typical of most arthropods. In fact, chelicerates' only appendages ahead of the mouth are a pair of chelicerae, and they lack anything that would function directly as "jaws". The first appendages behind the mouth are called pedipalps, and serve different functions within different groups of chelicerates. Spiders and scorpions are members of one chelicerate group, the arachnids. Scorpions' chelicerae have three sections and are used in feeding. Spiders' chelicerae have two sections and terminate in fangs that are generally venomous, and fold away behind the upper sections while not in use. The upper sections generally have thick "beards" that filter solid lumps out of their food, as spiders can take only liquid food. Scorpions' pedipalps generally form large claws for capturing prey, while those of spiders are fairly small appendages whose bases also act as an extension of the mouth in addition, those of male spiders have enlarged last sections used for sperm transfer. How can I Contact Pest Control Gurgaon? If you need an effecitive solution from our pest control spider services Gurgaon, Give a call at +91-9870276582 and know the best services from Pest Control in Gurugram to get rid of your pest related problem. Pest Control in Gurgaon cover all type of Pest Control Service within 48 hrs of Time.